Virgola, the unique oyster & Italian wine bar located inside a restored 1800's alley in the heart of Greenwich Village is now serving Cocktail Bar. Virgola's inventive cocktail list, accompanies the Oysters, crudo, caviar and Italian specialties for which it has become known. Developed by Virgola’s owner, Joseph Marazzo, a renowned neighborhood bartender, Virgola’s cocktail list features Italian Classics, American Classics and Innovative Signature Cocktails. "I wanted to create a simple, one of a kind atmosphere where people could slip in to enjoy the space and our menu. Everything is comfortably priced to where our guests can indulge," Marazzo said. "Adding Cocktails has made the experience at Virgola that much better." Virgola’s own Estate Bottled Prosecco is the perfect aperitivo to stimulate your appetite. The Italian Classics, including a Negroni Royale, enhance the seafood platters. American Classics such as Bourbon Manhattans compliment the salumi selection. The house favorite signature black cocktail, the Virgola, is a gin based libation incorporating imported black squid ink, tomato water and several other Mediterranean ingredients. With an unprecedented dollar oysters all day, every day deal. 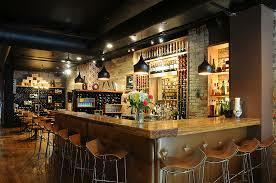 Winebar that take you on a tour of Italy. And now, a new and exciting cocktail program. This elegantly reimagined alleyway offers an experience unlike any other. Virgola, your oyster, wine and cocktail bar.